These Art Nouveau French Doors are genuine examples of fine art architecture. These doors are master hand crafted in 21st century America in the same hand and craft as the original, 17th century design, that inspired them. 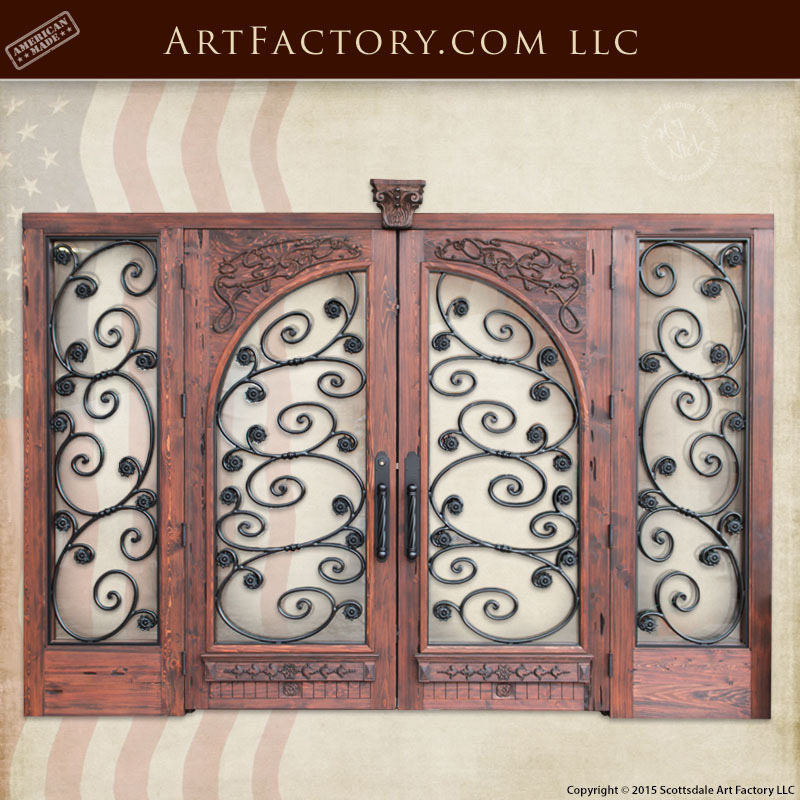 These solid wood, wrought iron, glass doors are carved by the hands of one master artist. This means a unique work of fine art that is created just for you. Our custom doors are never mass produced, gang carved, CNC'd, or built using any other type of fast process. We offer all styles of fine art entrance doors for your residential or commercial property, each built from solid, full length, naturally air cured timber. We build to your request. Whether you are looking for straight top, full arch top, or cathedral arch top doors, we can custom build the perfect style of door, just for you. Each custom door is manufactured using hand hewn mortise and tenon joined construction. This assures that your Art Nouveau French Doors are built to stand the test of time. As shown, grand entrance solid wood hand carved doors with solid hand forged wrought iron is custom handcrafted from solid 4-inch thick cedar cypress wood featuring a walnut stain finish, 1-inch tempered structural glass in panels. All species of wood are available and over 400 finish colors are available to make this double wood door a custom designed front entry for your home or office. These solid wood French door feature hand forged iron door grills, door handles, and decorative iron scroll-work on the matching door side lights, as shown in a black patina finish to resemble Art Nouveau French Doors. Available in single door and double door design, with optional decorative glass and custom iron hardware made from hand forged wrought iron by master blacksmiths. All sides of these custom entrance doors are fine art finished using hand applied methods for a virtually maintenance free custom front doors. All pre-hung custom exterior doors feature 1-inch rabbeted stop, weather stripping, tension adjustable hinges, roller style door latches, and adjustable crush proof threshold and automatic door sweep. Discuss your custom hand carved doors with one of our design engineers at 1-800-292-0008. All custom wood doors are engineered to exceed hurricane codes worldwide and are virtually maintenance free.